One Champion cast off her logical fear of lightening and stood grateful in the rain for a moment on her way to turn the sprinkler on in the garden. The dust did not get settled out on the road, but for a moment the gentle drizzle seemed to wash away a great deal of stress. Lingering aftereffects show up in Champion smiles. “The Olympics helps remind us what an awesomely diverse country we are. We all came from other places and different people groups. There is no one American look. Yes, folks, that’s what helped make this country great. I love it! :),” says Terri Ryan on Facebook. Champions appreciate the sentiment and appreciate Terri who teaches at Skyline and is a board member of the Skyline R-2 School Foundation. School will start on the 15th of August which will be here shortly. August begins auspiciously with a full moon, the Green Corn Moon, on the first. That is the birthday of Elitta January, who is so missed by so many. Before school starts Skyla Boyd will have her thirteenth birthday. That happens on the second of the month. She will be in the seventh grade when school starts. Saturday, the 4th will find all the political candidates over at the Vanzant Community Center for a ‘forum’ and the Judge’s Mom will have a birthday on the 6th, and then the 7th will be the primary election and things will settle down a little. Champions Foster and Kalyssa Wiseman will celebrate their Father’s birthday on the 8th. They do not care how old he is. The 10th and 11th are the dates for the Skyline VFD Picnic and the 11th will be the Fairview School Reunion. On the 12th the Champion resident, formerly known as Linda Dawson, will wake up to find that she has been married to Glen Cooley for fifty years! It all started in Nampa, Idaho back in 1962. They have children and grandchildren and plenty of reason to celebrate a golden anniversary. Then Kinzeleigh Crain will celebrate her tenth birthday on the 14.th She will be in the 4th grade when school starts the next day. That just covers part of what is happening in the first half of the month. The second half will be just as busy and the month will end with another full moon. That makes two full moons in one month and so it is the Blue Moon. It is figured that the first one is just the regular one and the second one is Blue. The General was over at the Up an At ‘Em 4-H Picnic on EE Highway Saturday night (probably on Friday too) raving on about the Blue Man. The subject came up in a conversation about folklore and superstition in the Ozarks when he suddenly became very animated, urgently questioning if anyone had information concerning this Blue Man. When he did not get the response he seemed to want, he made some furtive gesticulations, glancing about suspiciously, and directed the chat elsewhere. Elsewhere was toward a nice young fellow named Tim, who was just about to take his second bite of a very good hamburger. (The universal review by everyone at the picnic was, “Excellent burger! Excellent music! Excellent fellowship with friends! ) It seems that Tim is new to the area and the General has taken it on himself to introduce him to this part of the world which has been described by some as the most deliberately unprogressive area in the Nation. “Some is and some ‘aint.” It is sort of a hit and miss proposition, progressively speaking, according to which holler a person might call home and when he got there. It was certainly a ‘miss’ as the General was heard describing Champion as “just a little country store.” That it lies on the broad and shady banks of Old Fox Creek at the bottom of several hills and the conjunction of various county roads at the very Beginning of the Pavement was not part of his description, which he confined to a vague motion of the arm in the approximate direction of Champion and said “It’s about twelve miles over there.” He had nothing to say about how the Historic Emporium over on the North Side of the Square additionally houses the library and the community meeting and game room as well as the art gallery and museum and that the charming Proprietress has a guest book signed there by people from all over the world. Tim was not informed that Henson’s Downtown G&G has the most eclectic and complete inventory imaginable—wire nuts, calf starter and ice cream. When he was able to get a word in edgewise, Tim said he moved to the Ozarks for the easy living. So sooner or later, with or without the help of his new friend, he will find his way to Champion and he will be glad! Someone remarked that maybe one of the reasons the General so often makes friends with newcomers is that everybody around here already knows him. Yes, and glad of it! Champion! Get a look at Linda’s Almanac for August on line at www.championnews.us, or at the Plant Place in Norwood, or on the bulletin board at Henson’s Grocery and Gas in Downtown Champion. According to it, the best dates in August for planting root crops will be 1, 5, 6, 9, 10, 14, and 15. Transplant on 5, 6, 9, 10, 14, 15. Champions are urged to work only as hard as they can. The weather is too harsh for unrestrained, jubilant hard work. One is advised to head to the shade for the heat of the day. Get down to one of the beautiful swimming holes in this glorious part of the world and chill out. The Flag Dedication Ceremony at the 4-H Picnic was very well executed and put the crowd into a reflecting mood. If one does not know anyone personally who is currently fighting in Afghanistan or deployed to some other dangerous part of the word in the U.S. Military, that is probably because those serving only constitute about one percent of the population. The whole population, however, participates in that the taxes paid and the votes cast ultimately have an effect on the soldier whose boots are on the ground. For whatever reason the Nation requires service and sacrifice, they are doing it for the good of the whole. Acknowledgement with Love and Gratitude is the appropriate gesture toward all those who have served. The Skyline Auxiliary has a work meeting scheduled for Monday evening to get a start on getting the grounds in order for the big shindig. Absent from the group is Esther Wrinkles who is flat on her back convalescing at the Autumn Oakes Caring Center. The get well card that her friends sign does not account for how much she and her good energy are missed. It will take any number of them to pick up the slack for all the things Esther routinely does for the Fire Department. Champions wish a speedy recovery to one of their own. .
Rainbows require a little rain. It turns out, for scientific reasons, that each eye sees its own rainbow. “There is a rainbow round my shoulder and the sky is blue above. How the sun shines bright. The word’s all right, ‘cause I’m in love.” Sing your rain, rainbow, or love songs out on the porch at the Recreation of the Historic Mercantile in Downtown Champion. Send them or any ideas about how to get Cowboy Jack on the U.S. Equestrian Team for the next Olympics to Champion at getgoin.net. Come on down to Champion—Looking on the Bright Side! Some Champions are busy this time of the year plucking, shelling, peeling and slicing–doing hot work in the kitchen. Perhaps folks were just tougher in the old days or perhaps it was not so hot back then before air conditioning. That air conditioners might somehow have contributed to the overall warmth of the weather is a quandary too touchy to ponder. An informed Champion says that refrigerants no longer contain CFCs due to government regulation, but carbon is still the culprit when it comes to this kind of overheating. Back to the kitchen, Aunt Eavvie Sharrock said, “Our freezer’s full and so’s our jars. Not much is left but garden tares. High cost of living, we’ve tried to beat it, if God will let us live to eat it.” She would have felt right at home in Champion. Dear Champion and Champion friend, Esther Wrinkles, is in Mercy Hospital in Springfield as the result of having broken her hip very early Sunday morning. Her family is pleased to report that the repair procedure went well and that Esther is in good spirits. She will be transferred to a rehabilitation hospital in a couple of days. Her mailing address is Route 1, Box 845 Vanzant, MO 75868, and notes of encouragement will find her wherever she has to be until she can get home again. A speedy recovery is what her friends and family have in mind for her. It does not appear that she will be able to make it to the Skyline Picnic this year, but that is not a possibility that her friends in the Auxiliary are willing to consider at this point. “Esther will surprise you.” She has been a real worker for the Skyline Volunteer Fire Department since it first got started. She is a ‘Founding Member,’ pie baking, quilt making, music loving, tireless supporter of this important organization. The most recent quilt that she has contributed to the cause is on display down at Hensons Grocery and Gas on the North Side of the Square in Downtown Champion. Address a Champion picture post card to Esther while you are down there and imagine the smile it will bring to her. Go to the First Champion Tomato category at www.championnews.us to see some genuine sweet smiles. One of them is on the face of Louise Hutchison, another Skyline Auxiliary Champion who has made pies, sold quilt tickets, and run the picnic bingo parlor for years and years. Louise and Wilburn have some good help that lets them get out and about these days. Hopefully, they will make it over to the EE Picnic this next week end. They were there for the cool evening of the Vanzant festival, so perhaps their presence brings the cool factor. No wonder they are so much in demand! Grace Crawford will be seven years old on the 25th of July. She will be in the second grade when school starts up this fall. Taylor Blasius will be fourteen. She has completed the eighth grade at Skyline and is moving on to high school. Both of these young ladies have some excitement ahead of them. Taylor’s mother has been very active in the Skyline School Foundation and really represents the concept that if you want to get something done, give it to the busiest person around. That is Patricia, not just busy, but productive. The School Foundation is doing some good work. Already there are more than thirty members of the Dolly Parton Imagination Library receiving books every month as they learn the love of reading in preparation for starting school. Boosting and supporting the students and faculty of the little rural school is certainly a worthwhile endeavor and Champions are looking forward to more from the Foundation as time goes by. When the Fairview School Reunion happens on August 11th, attendees will have a chance to contribute to this organization whose sole purpose is to perpetuate the positive school experience they remember so fondly. Champion! When the Patriot Guard Riders attended the burial of Private Romualdas Prenskas the other day, they filled in the gap of missing family for this Veteran of the Viet Nam War. He was born in Lithuania and joined the United States Army after he became an American citizen. He was trained at Fort Leonard Wood. Lithuania is in a part of Europe that was occupied by Nazi Germany and then by the Soviets when the World War II was over. The War was over, but life was not easy in the Balkan states. However Private Prenskas came to America and for whatever reason, he stood up to serve his new Nation. With the exception of the indigenous peoples, the whole population of this area was made up of immigrants, the descendants of pioneers who came West from the Southern Appalachians. They came mostly from the British Isles, some before the Revolutionary War, then through Kentucky and Tennessee over time and finally to the Ozarks. People are still pouring in and out of this lovely part of the world and Champions acknowledge that everyone comes from somewhere. They are just lucky to lite in Champion! Tuesday through Friday this week will be a good time for planting above the ground crops. Thursday and Friday will be a good time to fertilize those things that are growing already. So says Linda’s Almanac from over at the Plant Place in Norwood. If water is available and some shade can be had or rigged there is some good growing season ahead still. Get a look at that Almanac on the bulletin board at the Recreation of the Historic Emporium in the heart of the commercial district in Downtown Champion. Stroll around and enjoy the view from the broad veranda. ‘When you hear it thunder, don’t run under a tree’ is good advice from the song “Pennies from Heaven.” This mention was made to clear up some confusion resulting from zealous expurgation. Many old time locals, as well as new comers, find music to be an important aspect of a happy life. Sing, “The night was dark and stormy. The air was full of sleet. The Old Man stepped out in the Yard and his shoes were full of feet.” Do not, however, sing the rest of the song because you will be in Champion and therefore—Looking on the Bright Side! The’ Dog Days of Summer’ have arrived in Champion. They are said to have started on the third of July and will end on August 11th. They are the nice toasty days that will be well remembered in mid-December. One old saying found in the book Ozark Magic and Folklore, published in 1947 by Vance Randolph, is that for every day in July that reaches one hundred degrees there will be a day in January that is twenty below. “The only sure thing about the weather is that a dry spell always ends with a rain.” This is a quote from Will Talbott, a Green County weatherman in 1930. Champions concur with this piece of wisdom and add that a tea cup of rain does more good in the garden than a washtub of well water. Some find a way to enjoy every kind of weather as an affirmation to being alive. Champion! Stories are being told and retold about a canoeing adventure on Saturday down around Dora. Krider, Watts, and Wiseman aunts, uncles, cousins, brothers, nephews, sisters, mothers and grandmothers all floated gently downstream and some went over the waterfall several times. There was only one report of a tipping over. An aunt and nephew went into the drink. It might have been as comical as the Near Drowning of Cowboy Jack, but not many details were revealed. There seems to be some sensitivity about the incident, and so, in this case, names are being withheld to protect the chagrinned. Carol Barnhart, helping out with the Vanzant Picnic, makes a point to remind people interested that the Fairview School Reunion will be held August 11th. There will be plenty of time for people to enjoy their get-together and still make it over to Skyline for the second night of the picnic there. The Summer Social Season is well under way. Saturday’s unexpectedly cool and cloudy weather made the Vanzant Picnic, well, a real picnic! First-rate music and food and great games for the kids were just the backdrop for a chance to see old friends and acquaintances for a pleasant visit. Louise and Wilburn Hutchinson had a good time and said, “Hello” to a steady stream of friends throughout the evening. Master of Ceremonies, Steve Moody, the banker, (not to be confused with Ray Bradley the undertaker) did an excellent job of keeping everything moving. He has the gift of gab and remembers everyone by name. The politicians were out in full force. They say that there will be a candidates forum there at the Vanzant Community Center on August 4th just before the election and then things should settle down a bit. It is to be noted that at this picnic and at the Skyline Picnic coming up that there are no conservative pieces of pie served. They are liberal every one. No one takes the right to vote for granted. An overheard conversation at the picnic included the opinion that the absolute corporate control of American politics is being exposed with greater clarity than ever before. If there were less profit to be made in war, there would be fewer wars. This person said that the 2012 election will be most interesting in that the many issues of the greed of unregulated capitalism are as visible as they were prior to and during the great depression. Champions made it through the great depression and came out of it stronger and smarter. Still, most of them probably would not like to go through it again. Linda’s Almanac from over at The Plant Place in Norwood says that the 19th through the 23rd will all be barren days. It will be a good time to kill plant pests and do general farm work. Then starting the 24th through the 27th signs will be favorable for planting crops that bear their yield above the ground. Champions and others in the area are busy putting up as much food as they can. Ruby Proctor was at the Vanzant Picnic the other evening and said that Barbara Jean has been canning green beans like crazy and putting lots of corn in the freezer. Barbara has retired after many years with Mountain Grove High School and is enjoying her new freedom. Ruby says she is working harder than ever in her retirement. For some new retirees, work is play. Linda will be in Champion Saturday to play bridge. The Champion player will host the Fortnight Bridge Club and is planning to make that excellent desert that gets served at Henson’s Downtown G &G when the Skyline Auxiliary meets there. It is a treat when friends share their good receipts. Patriot Rider, Tom Cody, was happy to report that his group had just escorted a returning soldier home to his family, whole in life and limb. The Patriot Riders and a number of other motorcycle clubs put themselves between families who are grieving the loss of a beloved U.S. Service Member and a certain religious/political group with a mean spirited agenda-driven stutter that they use to avoid actual thought. Champions think that Love and Gratitude are the sentiments to lavish on those who step up to do what their Nation asks of them. A rainmaking ritual used in extreme drought requires that an innocent child draw a turtle in the sand and then a circle around the turtle and then dance around the circle in a clockwise direction pausing and asking for rain at each cardinal point. There is plenty of sand in Champion to try out the ceremony. “Oh, every time it rains, it rains pennies from heaven. Don’t you know each cloud contains pennies from heaven? You’ll find your fortune falling all over town. Be sure that your umbrella is upside down…..So when you hear it thunder, don’t run under a tree.” That is good advice about not running under a tree. Explain your own rain-making superstitions, sing your favorite rain song, or give good advice at Champion at getgoin.net or in person out on the porch down at the Recreation of the Historic Emporium over on the North side of the Square. The word of the week is “compel.” It is just a pretty sounding word–compelling. When in Champion, one is compelled to Look on the Bright Side! In Champion the delicious rain was well received though it put some in the dark temporarily. There was no complaint to be had, even as some will be hauling brush or standing their corn back up. Official Champion rain gauges measured over an inch and spots up in North Champion had water closer to the two inch mark in their upturned buckets. The relief from the heat stress is palpable and the whole atmosphere is relaxed had happy. Champion! The power outage may have come at an inconvenient time for those in the dairy barn, but they are well prepared and accustomed to adapting to adverse conditions quickly when it is necessary. It will be a most interesting account to hear what Kalyssa has to say about getting her milking chores done. She is quite an enthusiastic farm girl. Local Future Farmers, at a very young age, probably already know more about many important things than do many a middle aged city dweller. They are Champions! An influx of Krider cousins is expected mid-week, with grandchildren pouring in from Tennessee and North Missouri, and all over. What fun! Hopes are that some grand photos will be taken out on the steps at the Mercantile over on the North Side of the Square—memory makers. Skyline sixth grader Ceiara Carroll will be twelve years old on the 14th of July. Kailyn Calhoun will have her fifth birthday on the 15th and will be in kindergarten when school starts. Ceiara most likely knows that her birthday is Bastille Day, which is the French equivalent of the 4th of July. It marked the end of the monarchy and beginning of the modern republic. The lasting significance of the event was in its recognition that power could be held by ordinary citizens, not in the king or in God. The oldest and largest regular military parade in Europe is held on the morning of July 14th in Paris to celebrate French National Day. Happy Birthday Ceiara and Kailyn! The debris and litter left after the 4th of July Parade in Downtown Champion could have been gathered up in a small tea cup. Such a tidy lot! Bags of ice went out the door of the Historic Emporium as revelers headed off to the creek. Emergency picnic supplies and necessities were on hand plentifully and the community is much gratified to have its needs met so well by Henson’s Downtown G & G! Down at the creek and out on the porch conversations covered a wide range of subjects. One was heard to say that those we now call ‘Patriots’ were just a bunch of rabble rousing misfits and malcontents. This sentiment was accepted with the addendum that they also be recognized as having been brilliant and courageous. The longest standing Constitution in the world now, it begins with the word, “We.” Similarities were drawn between players in the current political scene and the ‘Tories’ of the Revolution. One said, “You are what you eat and you become what you hate.” There is definitely food for thought there. New voter registration cards have Champions voting at Skyline now for all the elections. According to one election official, it is a matter of saving money for the county by consolidating voting districts. Annual gatherings give friends a yard stick by which to measure their own progress for the year as well as the chance to watch the communities’ grandchildren grow and flourish. It is delightful to see what excellent parents the children of friends have become. They are every bit as protective and unreasonable as their own parents were. “In 1860 I used to go to see a pretty little gal in Georgia and dearly she loved me. She promised she would marry me as soon as the war was over. She said we’d live together just like chickens in the clover.” It is sweet to see old couples still grousing in the same way thirty years later. They are still impatient with one another, but more accepting. Some have mellowed in charming and unexpected ways. Champions all hope to age as gracefully as do their precious friends and neighbors and are content to live like chickens in the clover. The break in the weather is a gift to gardeners. Linda’s almanac from over at the Plant Place in Norwood says that root crops planted on the 13th and 14th will yield well. Those will also be good days for transplanting. Linda’s staggeringly beautiful garden was on display as she hosted the regular Fortnight Bridge game on Saturday night. That plot of land feeds a great number of people and it is a joy to see. She has good help and has had many years to perfect her art. Her degree is in horticulture and her life experience adds an otherwise unattainable credential. The bridge game was pleasantly augmented by a Sterling visitor. This lovely young woman is a beginning bridge player and is studying to become a watchmaker. The aptitude required to work with the minute elements that comprise such mechanical marvels is awe inspiring. Linda is an excellent host and her guests generously share their exciting friends with each other. The Champion player came in with the low money and thus broke even in the game financially. She did come out ahead with cucumbers and squash and another pleasant memory. Sue Upshaw is receiving get well cards at the Texas County Memorial Hospital in Houston, MO, 65483. She has taken a fall and will be a while in the recovery process. Meanwhile it was observed that her spirits were much lifted by the good wishes of her many friends and family. Keep them coming! One will circulate through the Skyline VFD Auxiliary Meeting on Tuesday the 10th. Sue and her family have always been big supporters of the Skyline VFD and her presence will be sorely missed if she is unable to attend the Skyline Picnic this year. Get well soon, friend. Good news pertinent to Champion is welcome at Champion Items, Rt. 2, Box 367, Norwood, MO 65717 or at Champion at getgoin.net. Look for the fun at www.championnews.us or circulate through the Square. It is at the beginning of the pavement, at the bottom of some hills, where several county roads converge, on the banks of Old Fox Creek. It is Champion! Looking on the Bright Side. Champion was much in the spotlight this last Friday as people poured out from surrounding towns and communities to attend the first all-city yard sale on the Square in Historic Downtown. For many, it was a first opportunity to get a good look at the place which has been likened to the Light shining out of the East and described as the Very Jewel of Central Douglas County. Champion! This initial foray into a community market day proved to be quite the success, particularly in light of the temperature and the distance from other major shopping areas. A movement is afoot to repeat the performance sometime in the fall, maybe mid-September when the days will surely be a little cooler and the air will be sufficient to fill the bellows of the General’s accordion. Music is frequently part of the fun in Champion, so the many talented local artistes will have yet another opportunity to participate in a rich community life. 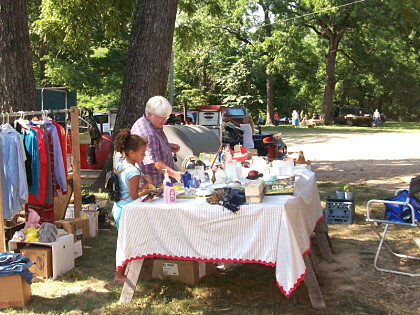 A number of locals, who retreat inside for the heat of the day, are beginning to gather their thoughts on just what items they might like to put in the next yard sale. Sometimes cash is better than ‘things’ and a thing no longer useful to one might be just what the next person needs. Kyra Collins will have her birthday on Friday the sixth of July and Tiffany Thornhill will celebrate on Sunday the 8th. They are both marking their twelfth birthday and will be in the sixth grade at Skyline this fall. That may seem like a long time away to them, but it will go by in a hurry. Older people routinely speak of the swift passage of time. Esther Wrinkles had a beautiful birthday celebration over at the Vanzant Community Center on Saturday. It was hosted by her sons and their families. She may well have received a card for every one of her 95 years. A pair of shockingly pink flamingos was the gift of someone who knows Esther’s fun loving personality and there was much interest in just where she will place them in her yard. Already the General is concerned that they will be wandering over into his yard. He is fairly persnickety about his lawn. His many flaws seem to be offset by his fabulous peanut butter ice cream. There were buckets of it, and of a luscious vanilla that was enhanced favorably by some succulent peach cobbler, and then, of course, there was the peach ice cream. Skillfully decorated birthday cakes and tasty brownies all made for a splendid party. The best thing though was seeing how much joy is to be had in sharing Love, Gratitude, and Appreciation for each other among dear friends, neighbors and family. Monday morning Esther was still smiling. She said that she was a little tired, but that she was so thankful for everyone who made the party happen and to everyone who came. It was a special day for a real Champion. The Vanzant Community Center is a great place to hold a party. It is air conditioned and this time of the year that is important. A note on the bulletin board there said that the 13th and 14th of July will be the Vanzant Community Picnic. The swift passage of time is evident again. The Up and At ‘Em Holt 4H Picnic will be rolling around again soon and, of course the Skyline VFD picnic will kick off on August 10th. Jeff Pardeck from over at the White River Valley Electric Cooperative in Branson has granted another $100.00 worth of electric power to be awarded to some lucky supporter of the Fire Department. White River has been doing this for Skyline for more than ten years now. They are nice folks over there and good neighbors. Soon the picnic quilt will be on display over at Henson’s Grocery and Gas in Downtown Champion. There were fifteen members in attendance at the last Skyline Auxiliary meeting there on the 27th of June and the next meeting is scheduled for the 10th of July at 6:30 in the evening. The newly air-conditioned meeting room at Henson’s G & G can accommodate a sizeable number of people and the picnic organizational meetings are a perfect time for Skyline Fire District Members to get acquainted with each other and to contribute their good ideas and good energy. Volunteer fire departments are essential parts of thriving rural communities. Someone noted that the population of the area is growing, but the average age is also increasing. Young folks are in short supply and much needed! Harley is missing his granddaughters. Their lives are filling up and they do not come around as much as they used to. What is important at one age may not seem to be such a big deal at another time in life. The swift passage of time might catch up with these ‘whippersnappers’ yet. It is a universal issue felt by many over the years. One old Champion wonders if she neglected the old people she loved so. Probably she did. Esther Howard has a good perspective on the process. She says to just enjoy it. Ira Glass is a radio personality and the second cousin of composer Phillip Glass. Phillip told Ira in an interview, “People do not know what they like. They like what they know. “ That is a very interesting statement and one that can be applied to more than music. It is less easy, as people age, to stay receptive when it comes to new things. Someone said that the tendency to romanticize the past makes it difficult to recognize how lovely the present might be. These are the kinds of thoughts that keep things lively among the Saturday Philosophy Club which holds its early morning meetings out on the porch at the Historic Emporium now being referred to as the “G & G.” They retreat to the air conditioned meeting room later in the morning. Linda’s Almanac for July is posted there and so Cowboy Jack will have time to study it with the hopes of getting a few vegetables in yet. The 9th and 10th will be good planting days. It turns out that there are lots of ripe tomatoes in Champion already and it is not that gardeners do not share, they do. They are just not interested in the acclaim and so the First Ripe Tomato in Champion Contest has officially been called a draw because Champions are a noble lot. “Oh! Beautiful for spacious skies, for amber waves of grain!” Independence Day is a chance to recognize the service of Veterans and those currently defending the lovely Constitution of the United States, to sing some patriotic songs, to get together with friends for an annual renewal of old acquaintances and to get feet wet in cold creeks. It is an opportunity to hear what common and wide ranging thoughts friends and neighbors have about gardening, health, politics, weather, art, music and philosophy in general. One noted recently that for every individual interested in a given subject, there is a different valid perspective. Differences are, after all, what most people have in common. Tolerance and mutual respect are the glues that hold dissimilar attitudes together in one great Nation—the melting pot. Huzza! Eat your ice cream before it melts, out on the porch. Get a good view of Champion—Looking on the Bright Side!